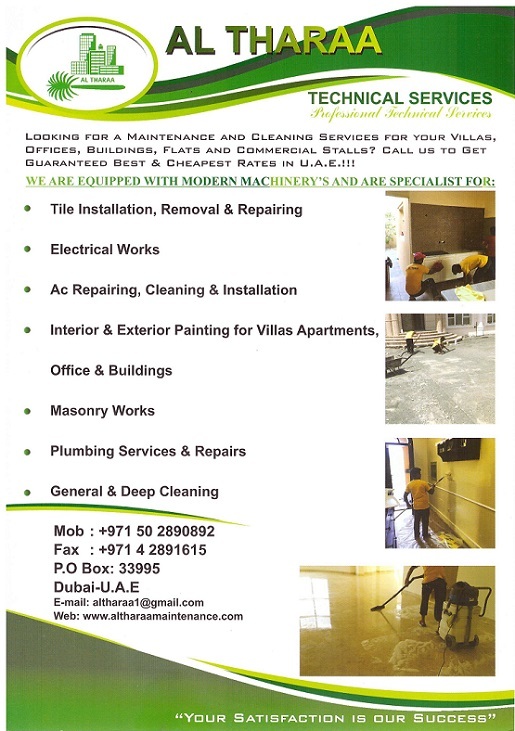 Al Tharaa Technical Services - Looking for a professional maintenance and cleaning services for villas, offices, buildings, flats and commercial stalls? call us to get guaranteed best & cheapest rates. For over 10 years, Al Tharaa Building Maintenance has been expertly serving multi-location Villas, Offices, Apartments, Retail stores and Schools all over UAE. As one of the top trusted facility maintenance , repair and cleaning company in the UAE, Al Tharaa Building maintenance has created a full trust from our avid costumers with our knowledgeable and professional Engineer, electricians, painters and cleaners throughout the country. Add to this, the industry-leading technology and work order management portal, and it’s easy to see how Al Tharaa Building Maintenance has your facility maintenance and cleaning needs covered from curb to roof. Free signup for best promotions in your City! Copyright © 2016-2017, tomatoMAID. All Rights Reserved.